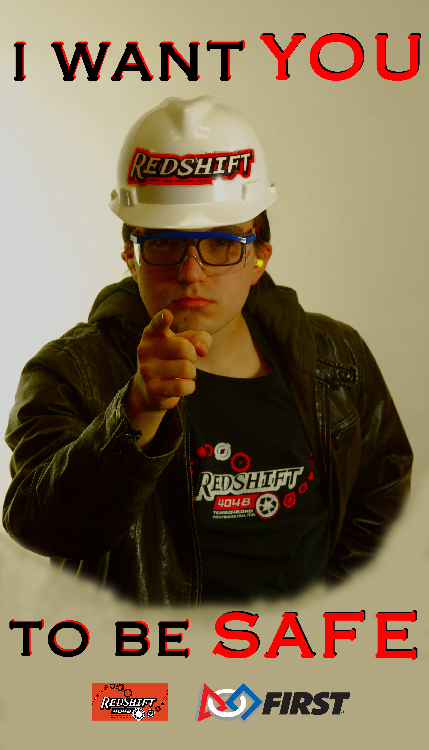 * All students must observe the proper dress code when in the workshop or handling the robot. * Personal Protective Equipment - we have safety glasses available for all students and visitors. We also stock hearing protectors, face shields, soldering station air filtration, hand sanitizers, and work gloves. * All students involved in robot contruction are required to take workshops before using tools. A tool used improperly can be hazardous and proper usage (from a hand tool to a power tool) is not only safer but also yields better results. * A First Aid kit contains bandages and dressing for most first aid needs. It also contains Material Safety Data Sheet (MSDS) printouts for all relavant materials we use. * Students get CPR training (but not certification) through the school. The team also holds basic First Aid training. * A dedicated battery cleanup kit provide cleaning and handling materials in the unlikely event of an battery acid spill. * All adult volunteers are given a background check (CORI) by the school District every three years. The Safety Poster is something we started in 2016 as a fun way to artistically promote safety at competitions. Each year, we create a near-full-height poster that attempts to use one or more memes or themes in its safety message. The central theme for our 2018 poster was the Tide pod challenge that was rampant on the internet. We then pulled from the Three Wise Monkeys (twisted the "speaking" into "eating") and played on the Tide ad from the Superbowl that year to form the resulting PSA. Our art group made a hat (modeled after the Mario Brothers game) for each student on the team so we started there. The three students wore a hat and T-shirt of the corresponding color to pay homage to the Power Up challenge. Each has their hands as posed by the Three Wise Monkeys. The two students in the back row are wearing PPE (safety glasses and hearing protection) to match their respective hand position. 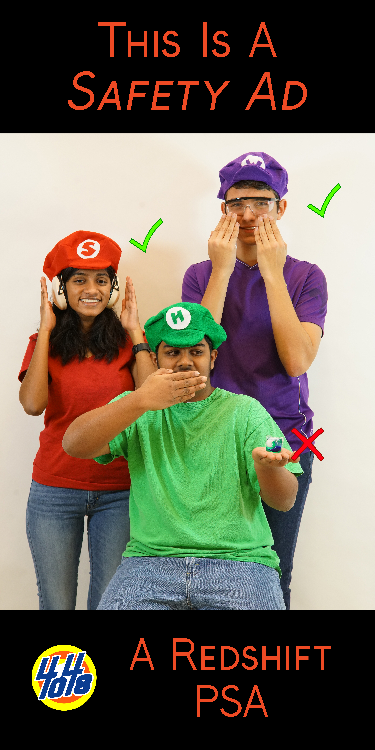 The student in the foreground is holding a packet of Tide pod detergent on his hand with the red X for do-not-bite. For the Superbowl, Tide ran a clever series of "This is a Tide Ad" ads and we played off that in the title. We also played with the graphics on the bottom text. Steampunk meets Star Wars in our 2017 poster. Star Wars (episode 4) fans will recognize the title as a reference to Darth Vader's famous line "I find your lack of faith disturbing". Each student is wearing our team Steamworks hat. The student on the left represents Darth Vader and his fingers on his gloved hand are in a very slight pinching pose. The student on the right is subtlely reaching for her throat. 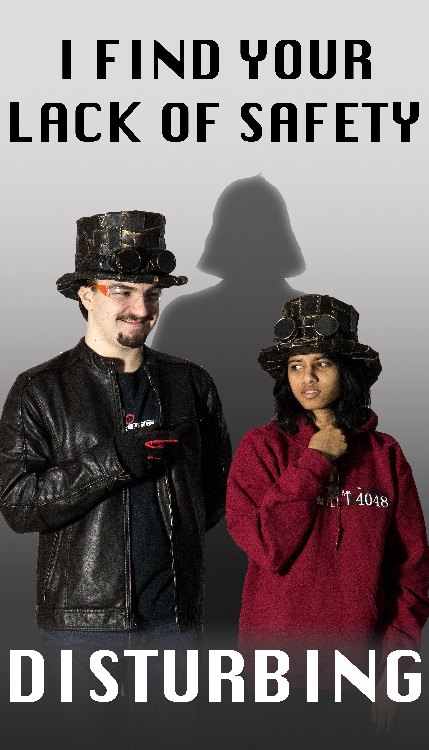 The lighting is from the left, slightly below level and casts a Photoshopped shadow in-between the two students that resembles Darth Vader's outline. This poster is a pretty obvious play on the "I Want You" Uncle Sam poster. It's pretty self-explanatory. We made a variant of this poster where the text "From Germs" replaces the Redshift and FIRST logos at the bottom. This variant was used as a wrapper on a bottle of hand sanitizer. The PPE for this poster are obvious - ear plugs, safety glasses and hard hat. The bulk of the time was spent getting the right "look" followed by desktop digital editing.